We all stayed overnight near St Pancras and were on the Eurostar in good time. All went well with the journey. The tgv was slightly late at Guingamp but the connection was waiting. 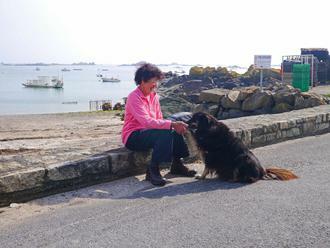 We enjoyed a pleasant evening meal and then a walk round Paimpol harbour and marina. We knew that today was a long day so set off promptly at 9. 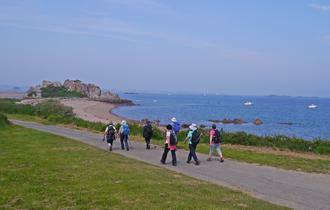 The early walking up the estuary from Paimpol went easily. We had a stop at Perros-Hamon church and looked at the plaques to the many fishermen lost at sea. 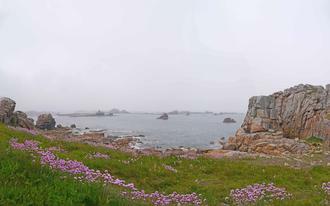 The walk then took us round the end of the peninsula with lovely, but misty, views over the bays, and rocky islands. We stopped at a tidal pool to look at an egret and two shelducks. Our plans for a latish lunch at Loguivy were foiled by the closure of the cafés that we had earmarked. We found an open restaurant, however, where some of our number had lunch, some opting for child-sized portions. The rest of us, who did not want a full meal, made do with an ice-cream and what we had with us from the boulangerie in Paimpol. After lunch we walked up the next estuary where the first part of the walk was quite tough with some steep up and downs among the trees. This slowed us up quite a lot but eventually the path levelled off and followed the coastline down the estuary fairly gently. It was pleasantly shaded and close enough to the sea for us to have delightful views and enjoy the various coves. After a final twist to avoid walking on a main road we crossed the suspension bridge into Lézardieux. Oh, and the weather was excellent all day! As our hotel did not do dinner we had booked into to a nearby Auberge where we enjoyed an excellent meal. Encore du poisson. Distance walked: 23 km, 14.5 miles. We were puzzled by the description of the walk today. It was 20 km but was declared by our notes to be short. We visited the supermarket and boulangerie first thing as we knew that there were no obvious lunch places on the route. We started with a taxi transfer to Sillon de Tarbet near the tip of the peninsular. The walk followed the coastline all the way round the top and then down the next estuary. 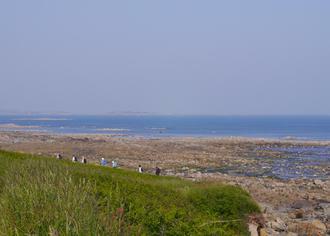 The first part was mostly on a path close by the sea or on the beach and had lovely views of rock formations. After lunch and, for some, paddles on a beach, we went inland a bit due to the high tide. The remainder of the walk was more inland and we were impressed by large fields full of artichokes. We also visited a dolmen. We took another high tide diversion making the walk a little shorter and arrived at our hotel by 4:30 so it was quite a lot shorter, in time, than the day before, though nearly 20 km in length. The hotel was very friendly and Phil and Margaret took advantage of the swimming pool to have a swim. Plenty of beer was consumed and dinner was a set menu with roast monkfish as the main course. It was again delicious. Distance walked: 20 km, 12.25 miles. The day started with a short taxi ride. We then visited a Boulangerie to ensure we had a lunchtime baguette. The walk started at the church, St. Gonery, which was not open. This was a pity as it looked to have some interesting frescoes. After a little bit of a hunt for the precise start of the walk - the signs were no longer there due to some new housing - we set off. We soon reached the sea and picked up the coastal path. After passing some oyster farms and then some beaches we reached the most northerly point of the walk at Pointe de Château. We went out onto the headland and enjoyed views of rocks. Due to a large sign, some of us thought this was the bird sanctuary at Le Goiffre but Chris F knew better! We continued on the walk and soon reached Le Goiffre proper. The fairly short detour round it was fully worthwhile due to the rock formations and the wild flowers, particularly the thrift. We saw a linnet and a chough plus other birds that we did not identify. We continued along the coastal path, aware that the state of the tide meant we would probably have to take a long detour. When we reached the point of the detour we went down to have a look at the causeway crossing and, ever alert, Chris F spotted a sign giving a shorter detour than the one in our notes. This detour went through high reeds, occasionally along a wall and involved a dodgy plank over a stream, several choices where the best alternative was not always clear and not always taken. We emerged triumphant and soon after arrived at our hotel on the sea front. Beer on the terrace by the sea was a necessity for most of us and Phil and Margaret indulged in some sandcastle building and a paddle. Another good day! Distance walked: 19.75 km, 12.25 miles. We knew that today's walk was a little shorter and started at the hotel so we set out at about 9:30. Since there were no shops nearby we took a picnic from the hotel. The first part of the walk was either on or above beaches. We had two pleasant stops by beaches, one for the morning break and one for lunch. The path then took us inland through a small town. We had a look in the large church of St Ives, which had some attractive stained glass windows, and then meandered through the village admiring the local gardens. The path then left the road and dropped through some pleasant woodland. 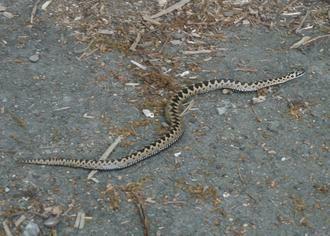 It emerged on the outskirts of Perros-Guirec and we reached our hotel by 3pm. 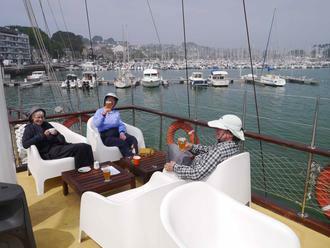 Some of us relaxed with a beer or two on a moored boat-bar nearby and others wandered round the locality. The walk after dinner took us to the miniature boating lake featuring a rather charming set of electric boats for children, with adult supervision, to drive. We also watched a cormorant eating a fish and having some difficulty getting it down! The weather had been a mixture of sun and mist during the day. The forecast for the next few days was not so good. Distance walked: 17 km, 10.5 miles. Today was a 'rest' day. We met Frances, a friend of Camilla from university, and her partner Malcolm. They have a cottage in Erqui. Frances had reserved places for us on a boat trip to the 'seven isles'. The weather was a bit dubious but the trip went ahead and was much enjoyed. The boat took us out to a superb gannetry and then landed us for a walk on one of the isles. It returned via the pink granite rocks so we had a preview of the next day's walk. The day started with a short taxi transfer, avoiding a walk across town. 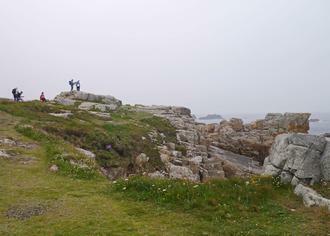 We then had an amazing walk through pink granite rocks. At Renote Island the group split as four of us wanted to do the 2 km detour. The circuit of Renote Island was great fun with birds and interesting rock formations. We had our second rain shower as we left and this meant that the next part of the walk had lovely light. The route then left the coast to go inland past a dolmen and alleé couverte. Apart from a brief mistaken detour, at least partly due to two yellow arrows at a sign post, the remainder of the walk went well. The last bit required crossing stepping stones over a stream but all was well. The meal in the evening was a michelin star meal at a restaurant attached to the hotel. It was delicious. The evening was enlivened by the accidental setting on fire of the bread basket by one of the candles on the table! Not much damage, fortunately, but much hilarity! Distance walked: 22.5 km, 14.5 miles. The weather was very misty. Our first requirement was a boulangerie so we altered the first part of the route to accommodate this. Sadly, by the time we reached the boulangerie, Phil's hip could no longer be ignored. Fortunately, with help of the tourist office, it was possible for her to be picked up by the baggage transport. This worked fine, particularly as the driver was the same as the one, with a taste for pink clothing, who had taken us to the restaurant the previous evening. 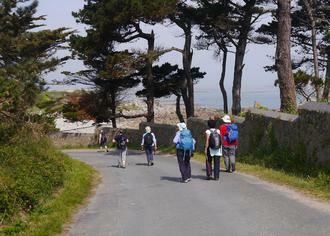 The rest of us proceeded along the coast path with some 'atmospheric' views. The path, passing some excellent sandy beaches, became quite overgrown and tricky as we approached the mouth of the river Léguer. 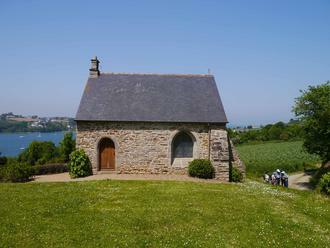 After a short bit of road walking, we found ourselves on the Chemin de Harlage, a walking track beside the river that led us right into Lannion and our hotel. We saw some shelducks and an egret on the way. We met with Phil at the hotel and enjoyed a beer (or two) in the garden before having our meal at the next door pub. Distance walked: 18.5 km, 11.5 miles. The overall total for the walking (excluding extras done in the evening and on the free days) was about 120 km or 75 miles. 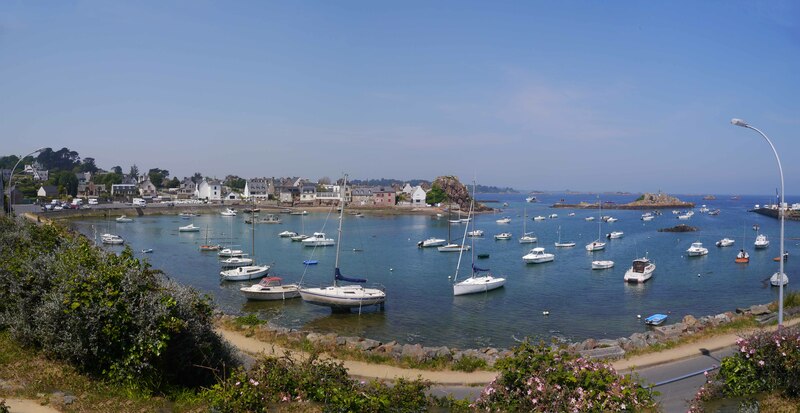 As there was a strike on the French railways, we had booked an extra day at Paimpol to avoid travel difficulties. Four of us took the opportunity to visit L’Île de Bréhat and take a boat tour. The others enjoyed exploring Paimpol. The maps come from our tracks recorded with a Viewranger app on a mobile phone. The actual maps are based on OpenStreetMap.